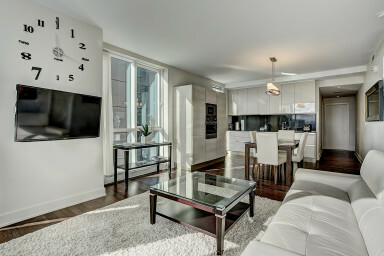 Located Downtown on René-Lévesque Boulevard West, this 2-bed and 2-bath condo is 1,200 sq. ft. and features floor-to-ceiling fenestration, private balcony and hardwood flooring throughout. Outstanding building amenities include a rooftop terrace, indoor swimming pool, and on-site gym, sauna, whirpool. Beautiful open-concept design, the best in creature comforts, and urban luxury await you in this spacious 2-bedroom Roccabella unit. The contemporary living space features stunning views of the city and comes fully furnished with two leather couches, wall-mounted flat-screen television, unlimited high-speed Wi-Fi internet, and a 4-person dining table. A European-style kitchen is equipped with high-end appliances, sleek cabinetry, and complete tableware perfect for entertaining. The master bedroom is queen-size and includes an en-suite designer bathroom with soaker tub and spa-like finish. The second guest bedroom offers two single beds perfect for the kids. Unit #1027 also includes free cable and local calling, linens, and front-loading washer-dryer laundry closet for your added convenience. For the finest in long-term accommodation, Simplissimmo has you covered! Central location and 5-star amenities make the recently completed, 40-storey Rocabella Towers one of the most exclusive addresses in the city! The only project with a direct entrance on René-Lévesque Boulevard West, residents staying here benefit from an exceptional lifestyle in the heart of the city, thanks to state-of-the-art building facilities including an expansive lobby entrance with 24/7 security concierge, a modern fitness pavilion, indoor saltwater swimming pool, spa, and a reception hall equipped with caterer’s kitchen. You also have access to three furnished terraces and BBQ areas, a shared lounge, some meeting rooms and a private cinema facility. Indoor parking and valet parking is available in the underground levels. numerous services and conveniences in close proximity. You will find a restaurant and a dental clinique in the building directly and you are just a few steps away from The Bell Center, the shopping on Ste Catherine, and many more restaurants!